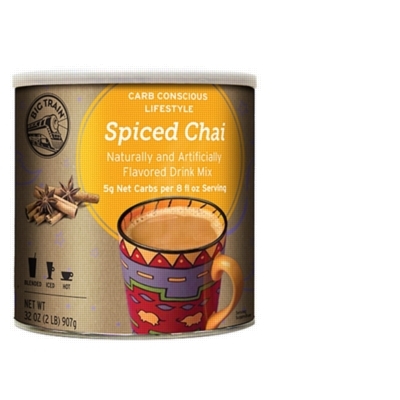 Buy two bulk cans of Low Carb Spiced Chai and save even more per can. Note: Manufacturing on this item has been significantly delayed. Orders placed for this item may not ship until late February 2019 at the earliest. Pour 6 fl oz (180 mL) of water into a blender, add 2 scoops (4 tbsp or 36 g) of Big Train Chai, add 12 oz (180 g) of ice and blend until smooth. Yield: one 16oz beverage. Mix one scoop (2 tbsp or 18 g) with 6 oz (180 ml) of hot water. Yield: one 8oz drink.